The burglaries took place in Co Wicklow and Co Wexford overnight. TWO MEN HAVE been arrested as part of Operation Thor following a number of overnight burglaries in businesses in Co Wicklow and Co Wexford. Shortly after 2am, a number of men forced entry into a filling station in Gorey Town. Cigarettes, along with an undisclosed sum of cash were taken. A short time later, convenience stores in the villages of Redcross and Rathnew were burgled, along with a phone shop in Wicklow Town. Sums of cash, cigarettes and mobile phones were taken during the raids. During a follow-up operation involving gardaí attached to Special Crime Operations, Dublin-based garda units and the Garda Air Support Unit, a car was intercepted in the Bawnogue area of west Dublin. Both men are currently detained at Wicklow Garda Station under Section 4 of the Criminal Justice Act 1984. The car involved in the incident has been removed from the scene for forensic examination. 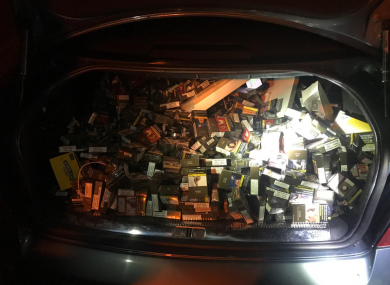 A large quantity of cigarettes, along with phones, sim cards and other property were recovered from the car by investigating gardaí. Email “Two men arrested after cash, cigarettes and phones stolen from businesses overnight”. Feedback on “Two men arrested after cash, cigarettes and phones stolen from businesses overnight”.